We’ve laid the last of the artificial surface and we’ll be finishing the line marking over the next fortnight then it’s ready for certification in early June 2018. This means certifiers will come and do a range of checks to ensure the track is up to international standard, ahead of next year’s season and the national track and field championships. It’s great to be this close to the finish for the athletics track! Once it’s signed off, Athletics Canterbury will arrange for athletes to access the track during the winter months ahead of the full opening next season. We’ve also just about completed the athletics covered seating and we’re continuing work on the athletics control building. Some of you may have seen this story recently on TV One about the athletics track at Ngā Puna Wai Sports. We’re delighted that Ngā Puna Wai will be a premier facility for our athletes to train on and very excited about the 2019 Track and Field Champs next year. 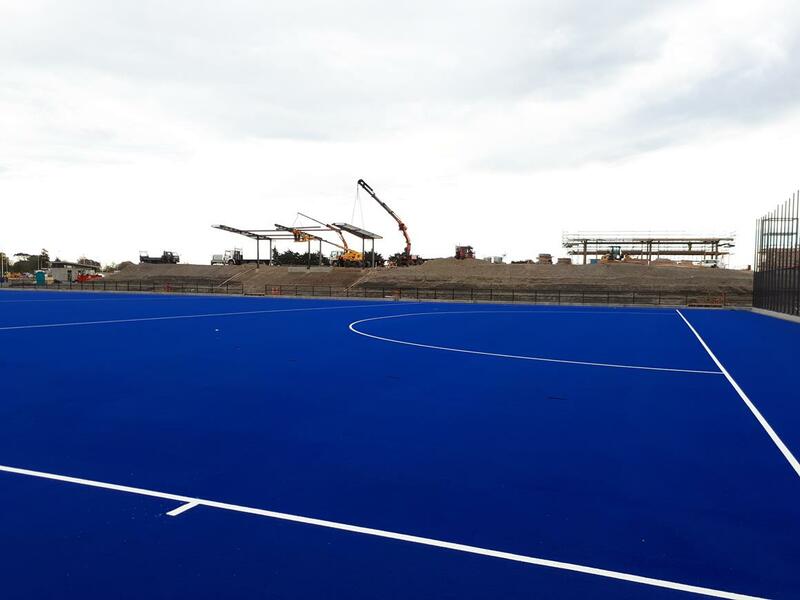 The royal blue carpet has been laid on both the hockey turfs so they’re looking pretty smart right now! The hockey covered seating is underway with steel framing erected. We’ve also sown the two community fields with grass and finished the blockwork on the social hub building. Throughout the next month we’ll be finishing off the public toilets, maintenance and pump sheds. In addition, the reminder of the main carpark and Augustine Drive entranceway will be sealed. The last of the remaining building foundations have been poured and blockwork will be underway on the change villages. We've decided to modify our carpark stormwater discharge to provide a better environmental solution and avoid discharging near a sacred natural spring in the Heathcote River. Unfortunately, this has delayed reopening of the Augustine Drive carpark until end of June 2018. 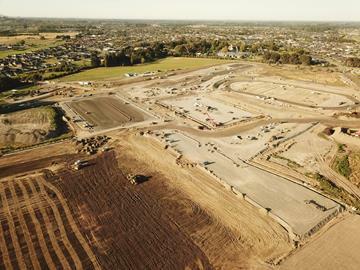 It’s full steam ahead at Ngā Puna Wai Sports Hub with loads of progress over the last month. We’ve laid the athletics track gel coat and work is currently underway on the top weatherproof surface. Seats are up in the covered seating area and we’re preparing to install the roof. The athletics control tower has also been built to the first level. Our hockey surfaces are coming along well with the carpet underway on the last of the two turfs. We’ve also completed the carpark sealing and landscaping. An exciting new start this month has been the social hub building with the foundation pour completed and the block work currently being installed. We’ve also laid the foundations for the changing villages and finished the roofing on the public toilets. Throughout the next month we’ll be completing the grassing of the community playing fields and progressing with the early earthwork platforms for our two rugby league grounds….stay tuned for more news! 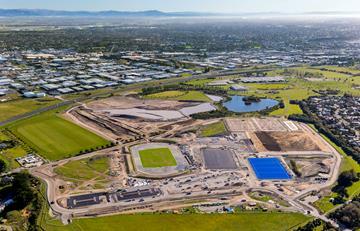 Look at the recent cool aerial photos we got of Ngā Puna Wai Sports Hub! We think it’s looking good! Work continues on the public carpark located off Augustine Drive with it remaining closed until the end of May. We’re sorry for any inconvenience this may cause while we complete the site entrance civil works. I was able to have my second privileged on-site visit this morning and, I was able to get to some places I couldn't get to last week. The gel coat (first layer of track, 9 or 10mm thick) is virtually complete now (just a small area of home straight to do over the area where there mixing of gel components for almost all of the track was carried out) and there is a bit of tidy-up work required on that before they put on the second coloured coat. The attached updated photos (with some captions this time for those of you who might have difficulty orientating yourselves!) may help in visualising where things are at and where they are heading. Note that there is continuing progress on the ancillary buildings and facilities which are starting to come together. I am advised that the warm-up grass area should be levelled in time for them to get a pre-winter sowing done. Forgot to check on the time-line for finishing and seeding the embankments. I found out today that the IAAF inspection/testing that is required to get the Class 1 certificate is booked in for next January. It needs to be done under warmish conditions in order for the force-reduction measurements to be meaningful. This means that any records set prior to certification will be pending-only and subject to retrospective approval when the certificate is obtained. I now need to get on to the ground socket details to accommodate our existing hammer cage from Rawhiti. Unlike the way that we put it in place, there will need to be an engineering design of the footings. The track surface that you can see is the almost-complete gel coat (only the home straight remaining to be done). A close-up photo (Photo #5 below) shows that it does look exactly like the bottom layer of the circular sample of Rekortan G13 which I have and which many of you have seen. Cody Linton was busy checking the uniformity of the thickness with accurate GPS and I was able to have a brief chat with him. He seems happy with the way it has gone down. Cody's guess is that, weather permitting, they will be at the stage of line marking in 2 or 3 weeks and I'll probably be required to be around at that time as a point of contact for the marking crew to make sure they have the correct interpretation of the instructions that I have give them (with a check on those having been carried out by Trevor and Craig). Before that, I'm booked in for another site visit next Tuesday morning but I don't anticipate that things will be looking much different then, with Eater intervening (although Polytan are working whenever the weather is favourable). Happy New Year! We hope you all had a Merry Christmas and a safe and relaxing festive season. We’re straight back into action at Ngā Puna Wai Sports Hub with the first of our bitumen pours completed on the Hockey Turf 2 platform. The bitumen provides the base layer on which the artificial grass surface is glued to. This week we are planning to bitumen seal the athletics track. Shortly we’ll be announcing our building works contractor for Ngā Puna Wai Sports Hub so we’ll keep you updated when that happens. They will be in charge of all the buildings onsite and will work alongside our other contractors to deliver the new sports hub. Carpark area earthworks are now complete and work is currently underway on the curbing and services. 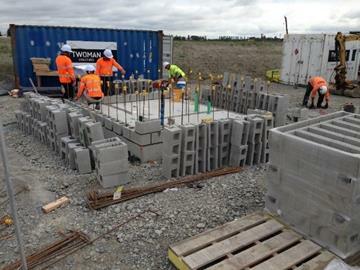 We’ve also completed foundation slab pours for the toilets with blockwork progressing. Those of you living close to Ngā Puna Wai may receive a letter regarding additional dust mitigation measures we have introduced on site. The recent hot and windy weather has meant an increase in dust and we are aware of the inconvenience this can bring to neighbouring properties. As a result we have introduced a range of measures which include: additional water tanks on site to dampen the soil and reducing the number of earthmoving machinery working. Our contractors are also keeping to defined routes when carting soil and reducing vehicle speed. However if you have any questions or concerns about the dust please feel free to contact us at ngapunawai@ccc.govt.nz or on 03 941 8999. Unseasonal bad weather over the last eight months has unfortunately impacted the early earthworks scheduled for spring: September, October and November. The very wet ground conditions has meant contractors needed to wait for materials (gravels and silts) to dry out before progressing with works. This has resulted in revisions to the construction programme with a new completion date for athletics moving from March 2018 to May 2018. We have also revised the opening dates for hockey to July 2018. Construction completion dates for tennis remain spring 2018 and rugby league summer 2018. It’s important to note the new forecast dates are based on an average summer of weather. If we receive excessive rain it may result in further impacts on the construction programme. To prevent any further delays we are reviewing the construction strategy on a weekly basis. Here’s a couple of 3d artist impressions of what the completed Stage One section of Ngā Puna Wai Sports Hub will look like! Check out our drone footage! There’s no holiday period for Ngā Puna Wai Sports Hub over Christmas with work continuing onsite throughout December and January. 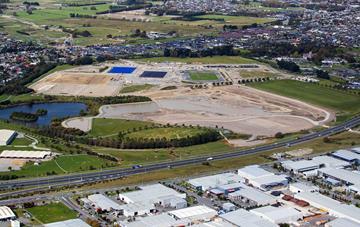 New areas in Wigram Basin will be opened up to allow us to extract more gravel needed for the sports hub. The next priorities include the first hockey pitch, carparks, embankments and the boulevard. Much like last month, a major risk to the project programme remains unseasonally bad weather resulting in delays to the early earthworks. We’ve continued to adapt the construction strategy to mitigate the effect of this weather on the programme. The athletics track was starting to dry out prior to the last rainfall but we still need another 400mm of gravel to complete these early works. Good progress is being made on the formation of the ring road. Developing this road will allow us to move gravel needed for the carpark area and hockey platforms. 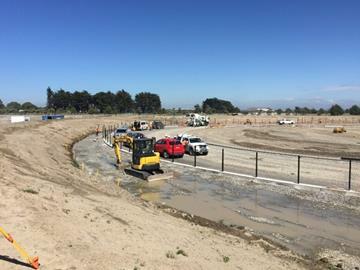 A lot of work is also underway on the stormwater drainage and water supply lines. Due to the poor weather we are over extracting where we have access to good gravel at Wigram Basin to offset the use of silt material which can’t be laid and compacted when wet. This will be used for the athletics track area, hockey 2 field and the carpark. Once the weather improves and ground conditions dry out we will use more silt materials on the remaining earthworks areas. Final work is underway on the Trust Deed with signing of the deed to occur at the end of this month or at the next PSG. There is a shift in governance with trustees becoming voting members with voting directed through the PSG. Previous voting members will attend fortnightly operations meetings to discuss tactical matters relevant to the sports at Ngā Puna Wai. The Operations Planning Group meets fortnightly with current focus on preparing for operations, events, funding, liaison with the A&P show and temporary facility needs. Vision and values workshops with trustees has been held to help define the culture for Ngā Puna Wai. Three additional workshops with sports codes to be held over coming weeks. The Safety in Design workshop was held on 22 September 2017. 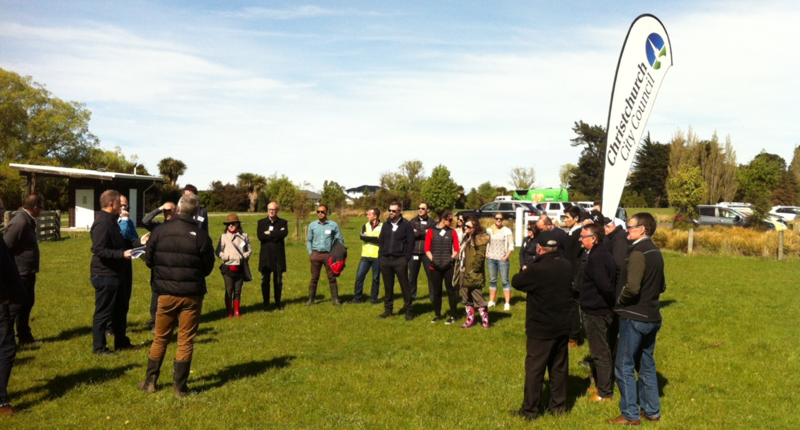 A project update was provided to Canterbury Agricultural Park users group meeting on 27 September 2017. A partnering workshop between Beca, Aecom, HEB Construction and Council was held on 4 October 2017. The building consent for the wastewater pump station was approved. The Building Works Request for Tender (RFT) was issued to preferred tenderers on 6 October 2017 and we are seeking to award the contract prior to Christmas. The Accessibility Review findings report will be finalised. Receive building consents for the public toilets and athletics and hockey covered seating. Buildings detailed design finalised and quantity surveying estimates carried out. Design of the maintenance and pump sheds, Hub building, change villages and rugby league covered seating completed and building consents lodged. Council consent team to approve noise management and landscape plans. HEB Construction Ltd, the Civil Works Contractor, are now fully established and in control of the site. The highest risk to the project remains inclement weather resulting in delays to the early earthworks. August rainfall was 107% of average (69mm against 64mm average), and September so far is at 165 per cent of the average monthly rainfall 60% through the month. Additional slot drains have been cut into the Athletics area to help with surface water drainage. We’ve changed our strategy to mitigate the effect of this weather on our programme, by shifting focus to the establishment of the ring road. Developing this road will allow us to move gravel needed for the carpark area and hockey platforms. The Operations Planning Workstream is underway, with a focus on getting the sports hub fit for purpose and ready to function. This involves a mix of stakeholder engagement, internal processes and launch events. This workstream will be through weekly meetings with the council and Select Evolution, and representation from sports partners is welcomed. A branding workshop with stakeholders, community representatives and elected members will be held early October to help define the overall Nga Puna Wai brand. Following this workshop further brand development around the statement, themes and culture will be carried out and key communications messages established. The Community Board approved the Landscape Management Plan on 12 September. Building consents have been lodged for the wastewater pump station, public toilets and athletics and hockey covered seating. The Crime Prevention through Environment Design (CPTED) report was finalised on 12 September with no issues identified in the overall design. Contractor Blakely Construction has completed the new high pressure sewer main and disestablished from site. Building detailed design reviews by Council are now complete and Beca is updating the drawings and specifications for issue. Civil works detailed design report issued, buildings detailed design finalised and quantity surveying estimates carried out. Design of the maintenance and pump sheds completed and building consents lodged. The Safety in Design workshop will be held, the accessibility review finalised, and Beca will complete their detailed design of the security/CCTV system, along with Wi-Fi and the PA system. Compile and issue building works Request for Tender (RFT) in early October. On Wednesday 9 August, we held a blessing and gathering to celebrate the start of major construction of Ngā Puna Wai Sports Hub's playing fields and the facilities we'll need to run them. The champions of the day were the staff and the volunteers representing all the sports and partners – Athletics Canterbury, Canterbury Hockey, Tennis Canterbury, Canterbury Rugby League, Sport Canterbury and Sport New Zealand – that have put in the long hours to get us this far. They were joined by local councillors and Christchurch City Council Chief Executive Dr Karleen Edwards to bless the site and the construction team before work began in earnest. Above: HEB Construction regional manager Adolph Marmetschke gets a blessing from Te-Kaharoa Manihera. The event marked a major project milestone – the awarding of the construction contract to HEB Construction Ltd, who started onsite that afternoon. They join Polytan NZ Ltd (who are constructing the athletics track), Rooney Earthmoving (earthworks), project management consultants AECOM and designer Beca, along with other critical specialists who’ve all played a role in getting us to this point. The construction contract means that we’ll start to see Ngā Puna Wai Sports Hub really take shape over the coming months. Bring on the fine weather so that we can open the first stages as quickly as possible in 2018. 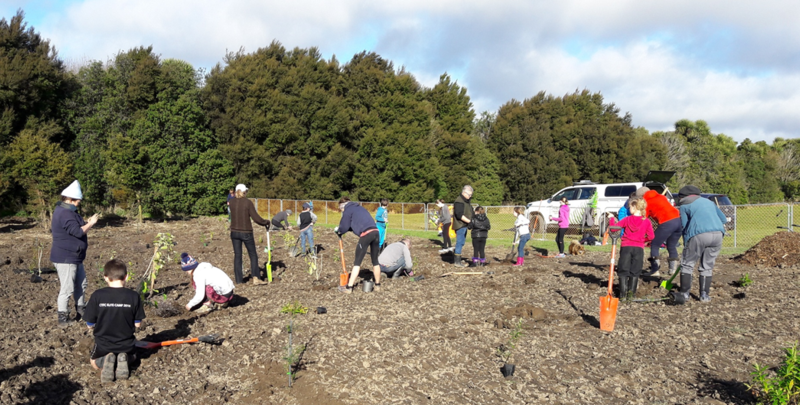 Many hands made light work on Saturday 5 August, where about 30–40 people – plus a few passers-by and some well-behaved dogs – pitched in to plant 350 native plants at Ngā Puna Wai. It was a good mix of people, including lots of really eager kids, with some volunteers saying on until 5pm, an hour after the event officially ended. Getting these natives planted is an important step in regenerating the area, and the team extends its thanks to all those who came in to support these efforts. 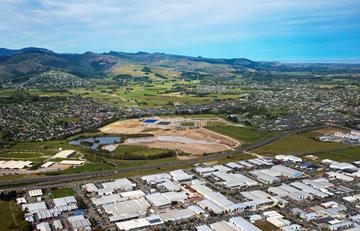 Wigram Stormwater Basin extension and spread over the Ngā Puna Wai site. The topsoil has been stripped and the Sports Hub's athletics platform is being built up now. This will save both projects $3–5 million by avoiding the need for material to be taken off-site. Rooneys Earthmoving Ltd is currently stripping off the topsoil ahead of the removal and transfer of the gravel. The early earthworks is expected to be completed in June 2017. Above: Ngā Puna Wai in April 2017.
fences and don't enter the work areas. public as soon as work is finished in them. We've also put up some extra signage to show the walking track and explain more details about the project. 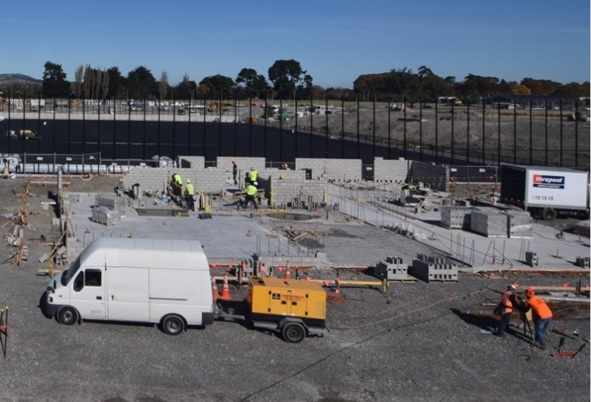 · Polytan NZ Ltd, the athletics track contractor, has nearly completed their design of the athletics track and associated facilities. They remain on target to begin construction of the athletics track in late June 2017. · The conceptual design for the Playzone – a playground for younger kids –is being finalised and will go out to the public for feedback. It's expected that the Playzone will be built towards the end of the project. Caption: Sport and Recreation Minister Jonathan Coleman fires the starting gun on development of the athletics track at Ngā Puna Wai Sports Hub, with pupils from Spreydon Primary and Aidanfield Christian schools. 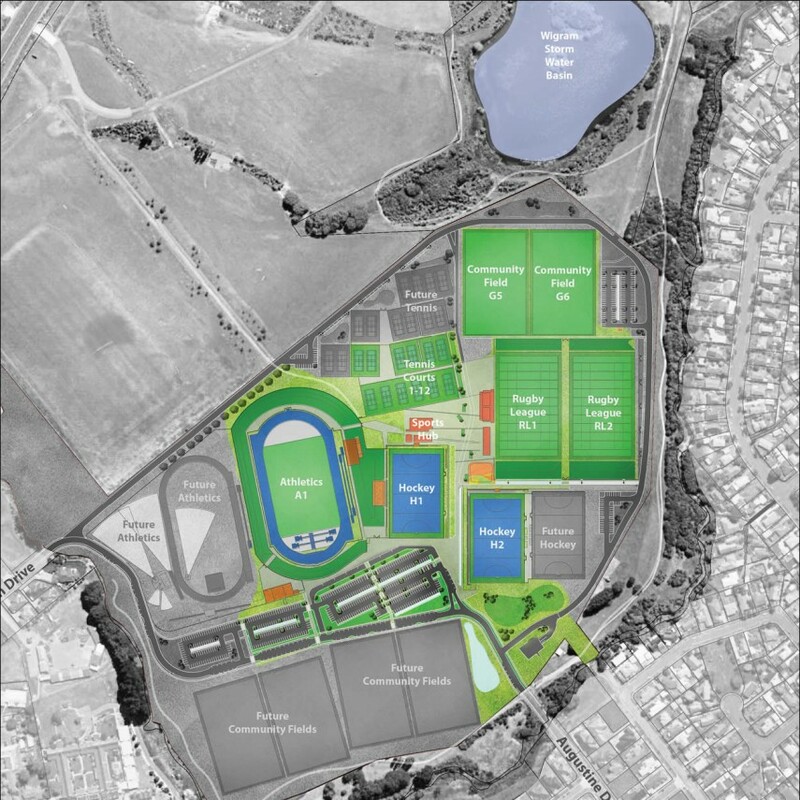 The countdown is officially on to the start of work on the new Ngā Puna Wai Sports Hub, with Sport and Recreation Minister Jonathan Coleman joining Christchurch Mayor Lianne Dalziel to celebrate the imminent development of a long-awaited athletics track. An afternoon of sports, speeches and sausage sizzles saw Mayor Dalziel gifted with contributions from Sport NZ, New Zealand Community Trust (NZCT) and SKY TV towards the Sports Hub. 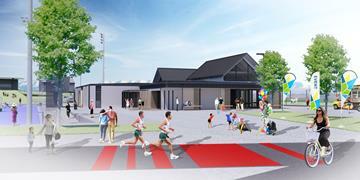 Development will begin with a new, international-standard athletics track that will serve the Canterbury community and help Christchurch secure national and international events. “We owe so much to New Zealand Community Trust, Sport NZ and SKY TV for helping us get Ngā Puna Wai across the line,” Mayor Dalziel says. 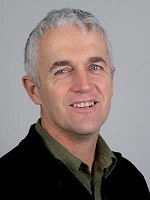 “NZCT and Sport NZ are each contributing $1 million, and this is SKY’s fifth $200,000 donation in five years towards the recovery in Christchurch. NZCT and Sport NZ have each gone over and above with their support for Canterbury sport since the 2011 earthquakes, and we can’t give enough thanks. 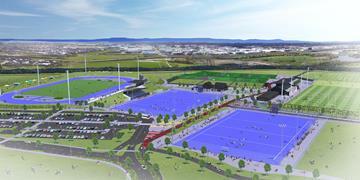 Ngā Puna Wai Sports Hub project throughout 2016. 2017 is the year we start seeing the results of the previous year’s hard work and planning. 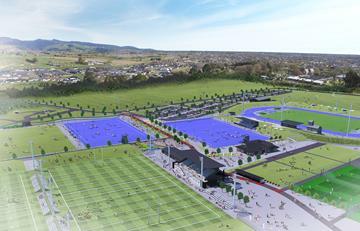 providing much-needed sporting and community facilities to Christchurch. Above: the final Stage 1 Master Plan as agreed by key partners. Click through for a larger image. be made to deliver it as soon as possible. AECOM was appointed. Their first task was a review of the existing concept design. Archaeological investigations and Preliminary Site investigations (determining the site is free from contamination). In December 2016, the Stage 1 Concept Design Brief (pictured above)was agreed on with key partners. Providing the funding required for the Ngā Puna Wai Sports Hub is a collaborative effort. The development of Ngā Puna Wai Sports Hub Stage 1 continues on track to meet the delivery of an athletics track in January 2018. The action is all behind-the-scenes, with the team focused on hitting some major milestones before Christmas 2016. 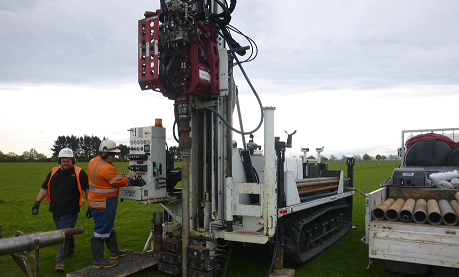 Above: Geotech specialists drilling bore-holes at Ngā Puna Wai. Geotechnical investigation work is now complete, and initial test results indicate good gravels beneath the top soil. The full report will be complete by mid-December 2016. Updates to the Concept Design were submitted for review at the Design Working Group meeting on 15 November 2016.
covered seating, a changing village and the size of the embankments. Keep watching this space to see the final design. is being reviewed by the Council. Options for a stormwater basin on the site are being investigated. The Preliminary Design project brief will be finalised confirming the detailed layout of the site. When laying out a busy hub with a lot of “moving parts”, every centimetre counts. The Cultural Impact Assessment produced by Mahaanui Kurataiao Ltd, documenting the history of the site and its significance to Iwi, will be ratified by Iwi next month. Matapopore will also finalise the Design Cultural Narrative, which will inform how we give extra meaning to the design that reflects Ngā Puna Wai’s importance. Legal documentation for all hub partners will go out for independent legal advice. This will set out how the hub will operate on a day-to-day basis once it’s up and running. 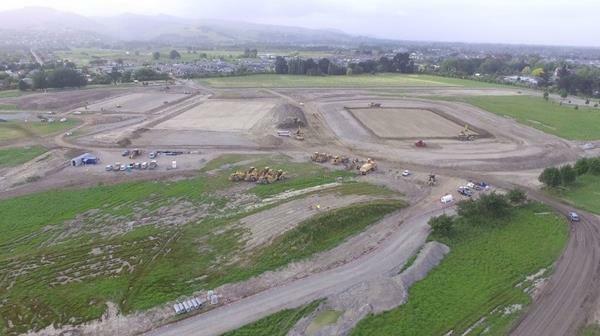 The development of Ngā Puna Wai Sports Hub Stage 1 continues to be on track to meet the delivery of an athletics track in January 2018. Final preliminary design is close to being completed and significant work on consenting requirements has been made. On Monday 17 October 2016 Ngā Puna Wai Sports Hub was mentioned in a newspaper article with a misleading headline that suggested the project was on hold. Rest assured, the programme is still on the fast-track, with the goal of having the athletics track ready by January 2018 and the hockey, rugby league and tennis surfaces ready in March/April 2018. There’s nothing like going out on-site to understand a project. On Thursday 13 October 2016, the sports partners and project teams met at Ngā Puna Wai. For many, it was a chance to meet each other outside of an email inbox and see the site in three dimensions, rather than as lines on a map. As well as learning about the site’s 800-year cultural history, and even longer ecological history, the team received a guided tour and were able to visualise exactly where each element would sit and how the Hub would fit within the existing community. A message from David Bailey, our project sponsor. There’s been an election since we last got in touch. There are some new councillors and community board members being welcomed who’ll be representing the area around Ngā Puna Wai, and our mission over the next few weeks is to meet them all and give them an update on the Sports Hub. Touching base with our local community boards is an important exercise. Besides offering to do all they can to see the Hub open as soon as possible for the benefit of sportspeople and the community, our most recent talks with the previous Riccarton–Wigram and Spreydon–Heathcote community boards gave us a steer as to their main areas of interest: retaining water quality, transport and access to the Hub, and how we can maintain and improve the overall ecology of Ngā Puna Wai. Council staff also recently knocked on 113 doors in the area to keep neighbours informed about the Hub and its progress. Awareness of the project was high, and the thoughts of the community boards were echoed along with questions about traffic, lighting, noise levels, preserving the walking track and providing a playground. All of the points raised will be covered by the consenting process – a Council process which makes sure every development meets standards of noise, lighting, traffic etc. to keep any impact on the area to a minimum. In satisfying the consent, we’ll address all the concerns of the neighbours and community boards and create a facility and space that the whole of Christchurch will be proud of. 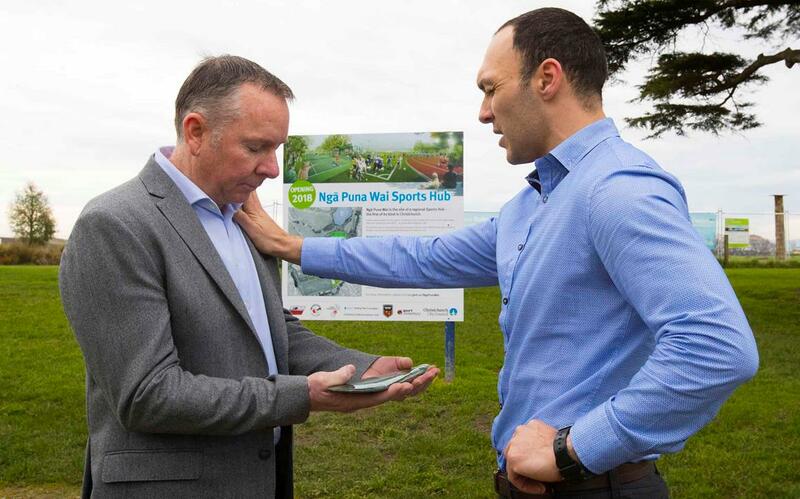 A milestone was reached on Monday 15 August when the Master Plan was approved by the Ngā Puna Wai Sports Hub Project Steering Group. The plan will be released via email newsletter later this week – it identifies the preferred locations for where everything will fit on the site, and opens the door for us being able to commence the design process for the civil works (foundations, drainage, etc. ), sports surfaces and buildings. We’re pleased to have this stage complete – it’s the perfect example of the partnership approach in action. Ngā Puna Wai Sports Hub requires the cooperation and support of all the partners, and the result is a truly inclusive project – one led by the sports, for the sportspeople as well as the wider community. Our success so far means we’re confident we can deliver Stage One on the fast-track schedule, which includes getting the athletics track up and running by the end of December 2017. Over the next few weeks, signage will go up onsite to let passers-by know what they can look forward to, and the team will be knocking on the doors of some of Ngā Puna Wai’s neighbours to talk through the project, answer questions, and gauge some of the feedback. • Over the past 30 days, the project team has completed a significant amount of work to moving the project forward. There has also been a focus on investigating how to get the athletics track up and running as soon as possible, and Athletics Canterbury has proposed having it ready by 17 December 2017. This is a major, positive development – please see below for more detail. • There has also been a preliminary site investigation, a site survey and an archaeological assessment of the Ngā Puna Wai reserve site. A Cultural Impact Assessment is now underway that outlines Māori cultural values, interests and associations with the area, and what the potential impact of the sports hub might have on these. 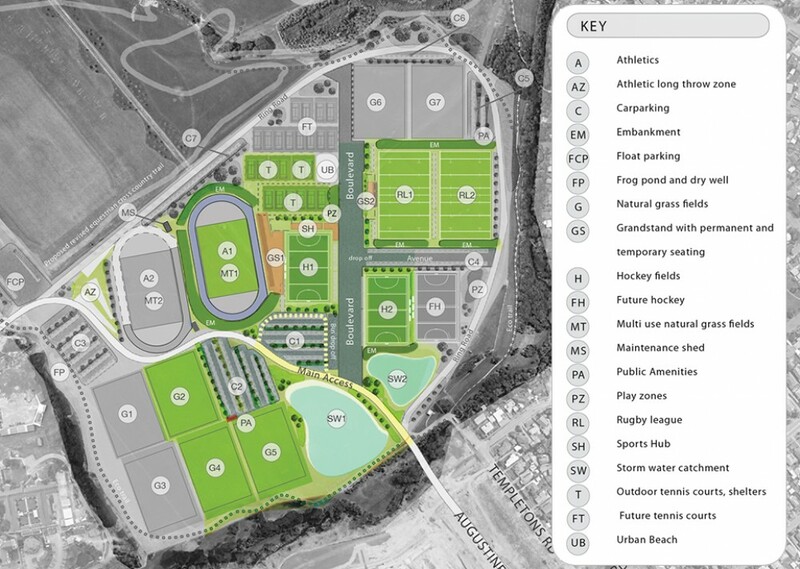 • The Masterplan has been independently reviewed, and the results are being used by the Design Working Group to optimise the final configuration layout of Ngā Puna Wai Sports Hub. This will be confirmed in the coming weeks, with the Group coming back with the optimal layout on 1 August. 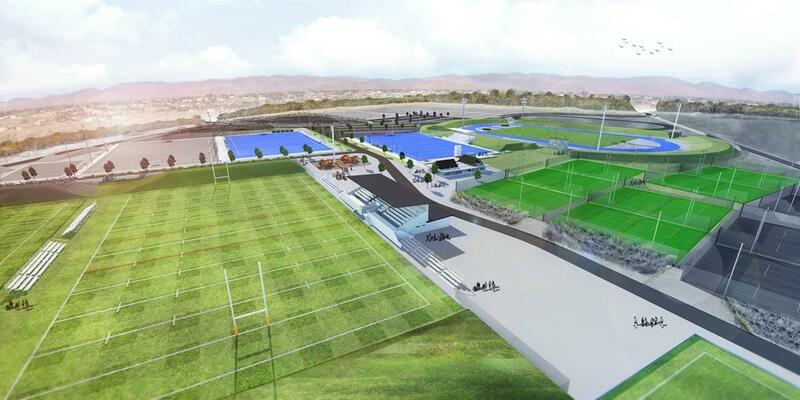 • Once the Sports Hub's final layout is locked in, then sports groups and users will get the chance to feed back on the nitty gritty of how Ngā Puna Wai will look and operate – from the height of the kickboards to the exact placement of the floodlighting, as well as exactly how amenities and facilities will be shared. These are the things that will affect how users enjoy the hub, and their expertise will be essential. The Council will hold workshops in this detail with sports groups, and will make sure the schedule is flexible. • Over the next while, the team will be going ahead with site investigations (additional geotechnical investigations, etc), reviewing costs against the budget line by line, and finalising a project risk management register. 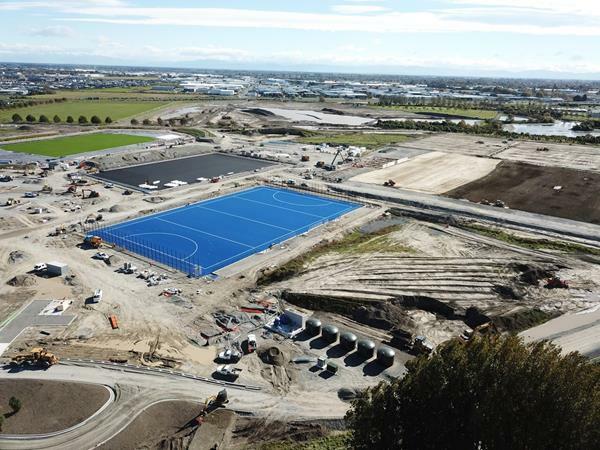 Creating the much-needed world-class athletics track needs careful planning – the particular type of rubberised track surface used needs to be laid in dry conditions over the warmer summer months, and these can be notoriously difficult to predict in Christchurch. As such, the Project Steering Group has had to decide on the best way of getting Ngā Puna Wai's track completed as soon as possible, while keeping long waits through the winter months to a minimum, and making sure the job is done thoroughly to an international standard. On Monday 18 July 2016, the team resolved Athletics Canterbury's proposal to have the track up and running by 17 December 2017, in time for the busy January–March 2018 school sports season. This would also mean lower project overhead costs than those of a longer programme, and will let us open many of the other Stage One facilities at Ngā Puna Wai at around the same time, rather than taking a staggered approach. Any faster than that – for example, working over the coming summer/autumn to have the track ready by winter 2017, would push costs to a premium, leaving less money for other permanent facilities, and mean that important elements like consents could be rushed. The work would also be disrupted by other work on the site.